1) Hedgehogs have protective hollowed out hairs that are commonly known as quills. They will roll up into a ball and flare out their quills if they feel scared or threatened. The quick movements and soft hands of a child do not mix well with this particular defense mechanism and, in reaction to being stabbed, the hedgehog may be dropped and injured. 2) Hedgehogs, like most other animals, will bite if mishandled. 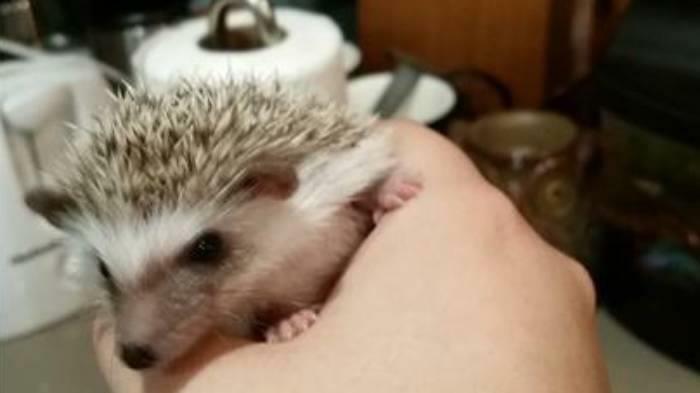 While adults can be bitten as well, children are more susceptible to being badly injured by a hedgehog bite. As insectivores, hedgehogs have very large and pointy teeth, two of which are very fang-like, that can puncture quite deeply. They also often walk through their own feces and can spread disease and infection through the transfer of germs. 3) Hedgehogs are skittish by nature. This can be difficult to cope with for anyone and it is even worse when a child who is naturally curious wants to play with his or her new friend and just ends up alienating them further. 4) Daytime playtime is a problem because hedgehogs are nocturnal and children, by nature of their school days, are usually not. I've had to tell countless families not to play with their hedgehog in the middle of the day no matter how tempting it may seem because it is akin to asking a human to wake up at 3am to go run around the block a few times. Overall, hedgehogs *do* make great family pets and can get along with people of just about any age. It is honestly up to the parent(s) to judge whether their child is responsible enough to handle keeping a hedgehog as a pet. But, like I said at the beginning, children under 8 tend to not do too well with the restrictions that hedgehogs pose as pets.